The purpose of "Whose Line Is It Anyway?" on DVD Campaign Central is to rally fans of the U.S. version of the popular improv show! The show ran for 8 seasons and is sporadically airing new episodes on ABC Family, with reruns each weekday from 10-11pm ET. More previously unaired episodes might be coming in the future, but they're currently on a hiatus. Drew & many of the cast members from WLiiA were featured on the new series, "Drew Carey's Green Screen Show" which was cancelled by The WB. Comedy Central picked up the series, though, and continued to show new episodes through the end of 2005 before cancelling it as well. Even though some never-before-seen episodes & reruns are still airing on TV every now & then, our goal is to get WLiiA released on DVD in uncensored full season sets so we can enjoy this great series anytime we want! With the current trend of TV shows on DVD, these campaigns will focus on urging Warner Brothers (the show's production company & distributor) to put the ENTIRE hit series on DVD! Thanks to every Whoser that participates! You ARE making a difference! UPDATE: WHOSE LINE "SEASON ONE, VOL. TWO " AVAILABLE NOW! Season 1, Volume 2 of "Whose Line is it Anyway?" is finally in our hands! It was released on October 9, 2007 and you can now order it at Amazon.com to enjoy whenever you want! Featuring the final 10 episodes of the show's popular first season, as well as never-before-seen footage, this two-disc set collection is uncensored! Please visit the message board at the studio's new website for WLiiA DVDs - http://www.watchwhoseline.com - to say thanks and to continue showing interest for future DVDs. Also, check out Season 1, Volume 1 on DVD if you haven't gotten a chance yet. You can read the news updates below and even sign up for our email alert list to get all of the information on WHOSE LINE COMING TO DVD! UPDATE #2: SALES ARE LAGGING, WE NEED YOUR HELP! Following the impressive sales of the Season 1, Volume 1 DVD collection, the Season 1, Volume 2 DVD set has not carried that momentum. Sales are down "quite a bit" according to our source at Warner Home Video who has checked with retailers. Check out the Campaigns page for more information on how your participation means more now than ever. 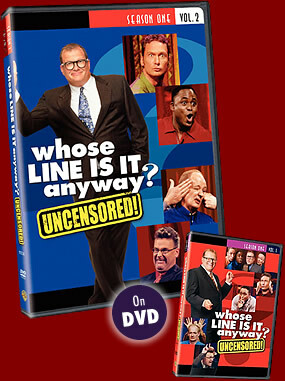 UPDATE #3: PURCHASE 'BEST OF' WHOSE LINE DVD, AVAILABLE NOW! Warner Brothers released a new "Best of Whose Line is it Anyway?" DVD set, featuring 10 of the show's funniest and most popular episodes! It went on sale June 9, 2009 and is available now for a discounted price at Amazon.com !